The Chateau de Montségur, located in the heart of France's Languedoc-Midi-Pyrénées region, 80 km southwest of Carcassonne, and situated 1,200 metres high on the summit of a natural hill, overlooks the green valleys of the Ariège along the mountainous range of the Pyrenees. Montségur is to be found on top of a rock formation known as a pog; meaning ‘peak, hill, mountain’. From its apex one has an astounding view, admiring the Black Mountain and even the city of Toulouse. The hill upon which the castle is found is sheer and dramatic, as though suspended between the earth and the sky. The name ‘Montségur’ originated from the Latin ‘mons securus’, meaning ‘safe hill’. Perhaps because, being so prominent even from far away, it was a point of reference for fugitives and victims, as well as being a genuine symbol of Cathar resistance to the Crusaders. Evidence of human settlement in the area take us back to the stone age, and there are also remains of Roman occupation, since Roman currency and tools were found in and around the site. The present ruin itself is the third structure to have been built on the hill, since in the Middle Ages, there was a castle belonging to the Counts of Toulouse, and subsequently other noble houses. Little is known about the fortifications at the time. Archeologists call this early castle ‘Montségur I’. 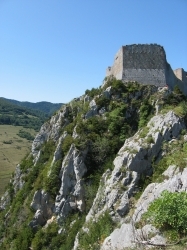 Later on, during 1204, Raymond de Péreille one of the Lords of Montségur, rebuilt the ruined castle and refortified it, making it a center of Cathar activities and home to Guilhabert de Castres, a Cathar theologian and bishop. It became a refuge for dispossessed Cathar families seeking shelter from the Catholic Crusaders, and was declared the ‘seat’ of the Cathar Church in 1233. In 1242, a military command of about 10,000 royal troops laid siege to the castle, which was defended only by about 100 fighters. The siege lasted nine months, until the castle finally surrendered. Approximately 220 Cathars chose to be burned alive en masse in a huge bonfire at the foot of the pog, instead of surrendering their faith. At the base of the mountain, a modern stele commemorates the death of the victims. Translated into English, it reads: ‘In this place on 16th March 1244, more than 200 people were burned. They chose not to abjure their faith’. The siege of Montségur is one of the most moving of all the tragedies associated with the war against the Cathars. There is a legend that during the siege, four members of the Cathars escaped carrying treasures and relics with them. The treasure has never been found and no one knows what it was, however many stories and rumours say that allegedly, it consisted of the Holy Grail. 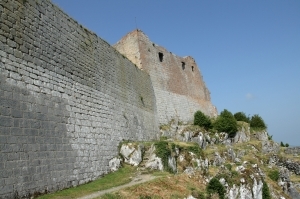 After the destruction of what archaeologists call ‘Montségur II’ during the siege, the present fortress was gradually rebuilt from the ruins during the 17th century. This was a building typical of post-medieval royal French defensive architecture, and is often referred to as ‘Montségur III’. At present, the stronghold has a series of three fortifications. Almost nothing has survived of the first, dating prior to 1204, while terracing that formed the bases of houses are still recognizable around the castle. The village was located to the north and west of the fortress, and probably consisted of wooden houses built around a stone tower. The Cathars, Perfects and other believers gathered inside the fortress, since its very location made it impregnable. 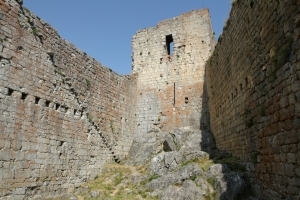 The square tower set against the west wall also dates from the period of the Cathars and provided access to a wooden ramp which linked to the lookout passage. The cistern where rain water was collected still exists. Another ancient feature is a room with the characteristic embrasure windows thought which, at dawn on the day of the summer solstice, the first rays of sun enter striking across from wall to wall. Almost all the visible remains of Montségur – a large square tower surrounded by a stone wall 2 metres thick – date from rebuilding done by the Lévis-Mirepoix, a noble family who were given fiefdon of the castle after 1245 under Louis IX, as defence against the kingdom of Aragon. It fulfilled this function until the early 16th century when it was finally abandoned. The castle was listed as a historical monument by the French Ministry of Culture since 1862. Viewing of the castle itself entails a steep 1,207 metre climb to the hilltop. This climb is not for the faint hearted, however there are benches on the way up, and stunning views along the way as well. Be sure to wear sensible shoes and take water with you. It is well worth it, as the views from the top are stunning and one-of-a-kind.